Phillips Island - It was almost evening when we arrived at this small town to have our dinner. My stomach was already "making noises" and whatever food in sight was good enough for me! 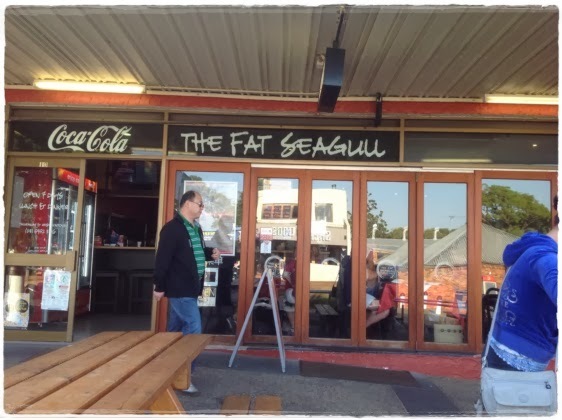 The tour guide recommended this place called Fat Seagulls, good food and prompt service. Never mind about the prices, as long as the food served are tasty, it is all that counts! Actually it was a serving for one person... but we surely couldn't finish this lot! Fish was very fresh and nice.. no smelly taste... Great!! Getting ready to "plunge" into the food... but as usual the camera gets to "eat first!" And we went to the shop next door to get this!! Wow, such huge kangaroo pizza, for 1 person, sure cannot finish. Made of kangaroo meat. Fish & chips looks good. Yes, I think their kangaroos over there are commonly eaten? I just tried a small piece anyway.. Yes, I am not a big eater but I love to try a bit of everything.. I guess that makes me a big eater too, in a way! hahaha... I love ice cream especially those with nuts and strawberries! If only we could take some pictures of those cute little penguins. Is it? They walked in three or four... five or six... really cute la..walking like humans like that... hahaa.. The fish and chips look delicious. Must be a wonderful feeling eating ice cream while walking in the cold weather. Kangaroo? No, thank you. Cold in the summer? Eeeee....lucky you, normally, the heat would be blistering, can fry egg on the manhole cover on the road. Ya!!!! Fish and chips!!! Nice. Dunno why the overseas ones are always so very nice...not like the ciplak ones that we have here, like Manhattan - I had in Penang once, the batter drenched in oil, so terrible!!!! When I see fish & chips on my blog list, I HAD to read yours first! I love fish & chips! I grow up with it. I hated fish when I was young, any fish, especially steamed coz my mum always steamed fish for dinner.. But when it comes to fish & chips (and tartar sauce), gawd, I can wallop the whole thing without using fork & knife, can just finish off with my fingers..
Wow, the kangaroo pizza very big wor, portion for 1 person? But for me, sap sap sui, I can finish the pizza by myself also, keke.. But the name kangaroo pizza sounds funny.. I would prefer it to be called "The Roo Supreme" or "The Kanga Delight", hahahaha..
Wahhh...you are very creative.. not sure what it is called but the waitress recommended us to take the kangaroo pizza... something we dont have over here.. . I love the fish & chips in Australia; and it is really so much different compared to the local ones we have here where sometimes there is more breaded flour compared to the fish fillet itself. Oh my, Kangaroo pizza is indeed exotic to us, though not so much over there as the kangaroos are really in excessive in their population! Oh yea, Phillip Island is great especially the small and peaceful town. The food looks good and now I feel like eating fish and chips! Ling, then you must go again...!! How does the kangaroo meat taste like in pizza? Like rabbit meat?? It is categorised as red meat?? Gelato??? I think I no need to guess who ate it the most to win the prize! Lol. Dont forget. The Australian portion for one is big enough for 2 pax. Haha. There's not a lot of shops in Philip Island - the main town is just a few strip malls but it was late when we drove out to eat and there's only one pizza place open and it's not this one. This one looks nicer. Haha. One Australian thing I miss is that they put eggs on pizzas. I hardly see it over here. Kangaroo pizza? So adventurous! I would love to visit Penguin Island again! I enjoyed myself very much when I was despite despite almost freezing to death. Lol!